Linking up with Neely and Amber for It’s OK Thursday. I have still yet to buy the first Christmas present this year. I haven’t put up my Christmas tree up yet. I always put it up Thanksgiving weekend, but it just hasn’t happened yet! 🙁 Maybe tonight? I went to the doctor yesterday for this horrible cold/cough mainly to get the Codan Cough syrup so that I can fall asleep at night! I haven’t been able to breathe and I needed the relief! I can’t wait to go home and watch our shows that we record with no commercials. The simple things make me happy! I have looked at SEVERAL stores, and I can not find the perfect stockings to hang on our fireplace! Anyone have any suggestions on where to look? I am not sure what “style” I want to go with yet. I was too lazy to make a salad for lunch today and grabbed pita chips and hummus instead. After my earlier said doctor appointment, I was really sore from the steroid shot that they gave me, so I went to Starbucks and got a Salted Caramel Mocha Frappacino WITH whipped cream on top. OK, I am a five year old and needed a reward for being a big girl…so what? I am going to window shop around The Summit on my lunch break today. Nothing wrong with some wishing and planning for the day when I have a little extra money! What are you OK with this Thursday? 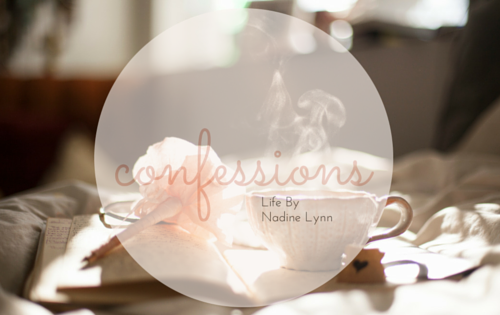 Deep Thought Confessions and a Link Up Announcement! When I was writing the post, I was thinking why must I talk about Starbucks, I want some now!